Zach removes the foundational layer of masking tape in his Resist Art project to reveal a creative design. Students of Step-Up are benefiting from a new partnership between Stepping Stones and Visionaries + Voices. 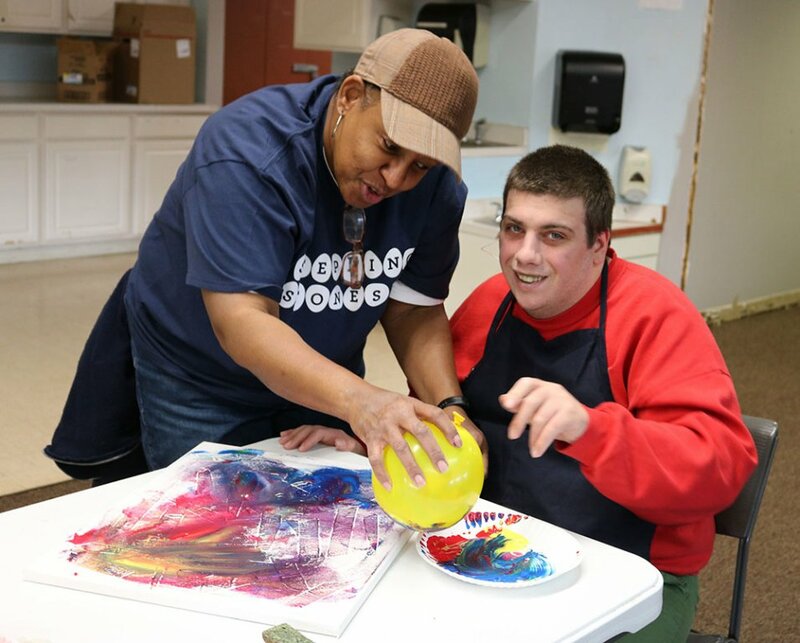 Founded in 2003, the local nonprofit is committed to creating a more inclusive arts community. 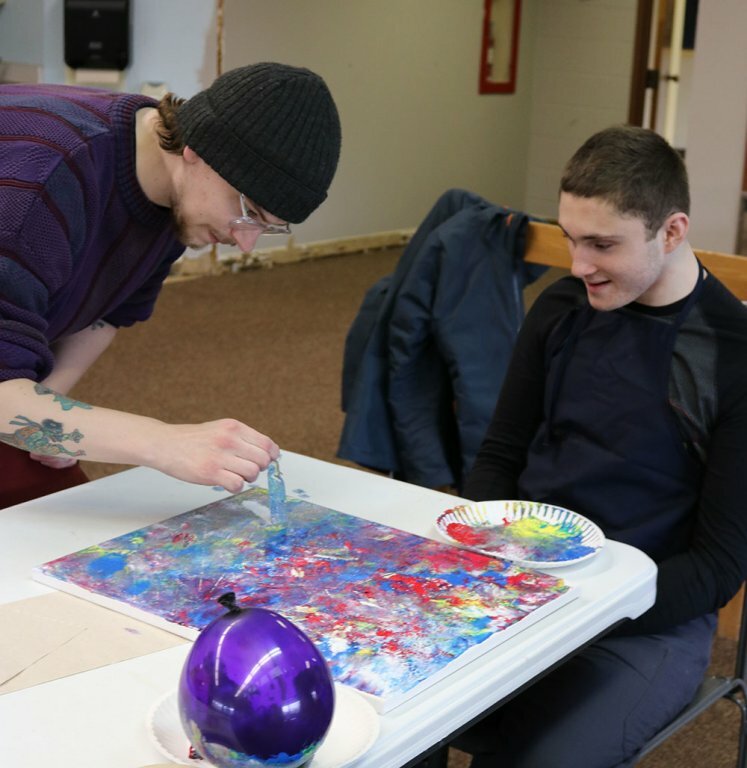 The partnership with Stepping Stones is a perfect fit and empowers our students with severe autism to channel their behaviors into a creative outlet. 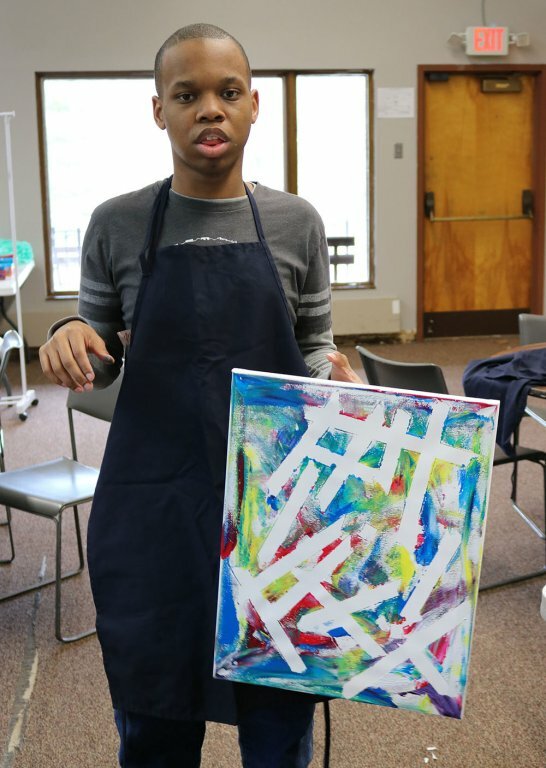 Every Friday, Visionaries + Voices leads art classes that promote social interaction, emotional growth and sensory integration. 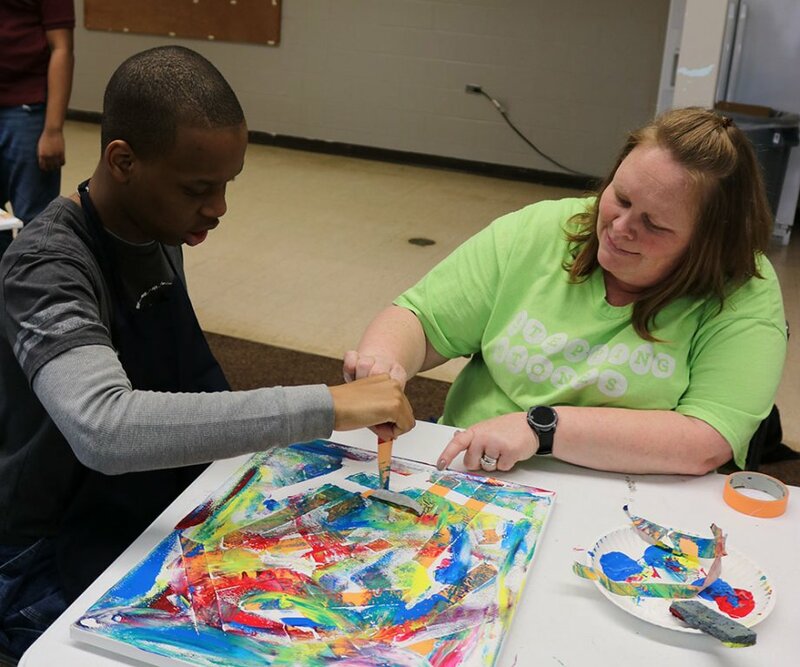 Working with educational aides, our students follow V+V instructors’ step-by-step instructions to create a variety of art projects. In a recent visit, groups explored a technique known as Resist Art. Students began by applying masking tape to a canvas in a design of their choosing. They then set out to paint over the tape with a variety of tools. Rather than using traditional paintbrushes, they painted with balloons, sponges and even forks to experiment with texture. After completing their painting, they removed the masking tape to unveil beautiful masterpiece of their own. “I think the coolest thing about having Visionaries + Voices come is seeing how creative our students truly are,” said Step-Up’s Educational Services Director Julie Hendricks. Stepping Stones founded Step-Up in 2004 as the region’s first autism alternative education program. We are proud to partner with Visionaries + Voices and work together in promoting inclusion throughout our community. To learn more about Visionaries + Voices and their work around Cincinnati, click here. In a Resist Art project, students applied masking tape to canvases in a design of their choosing. They then painted over the tape using sponges, balloons and forks to create a variety of texture. After finishing their painting, they removed the masking tape to reveal the finished project. 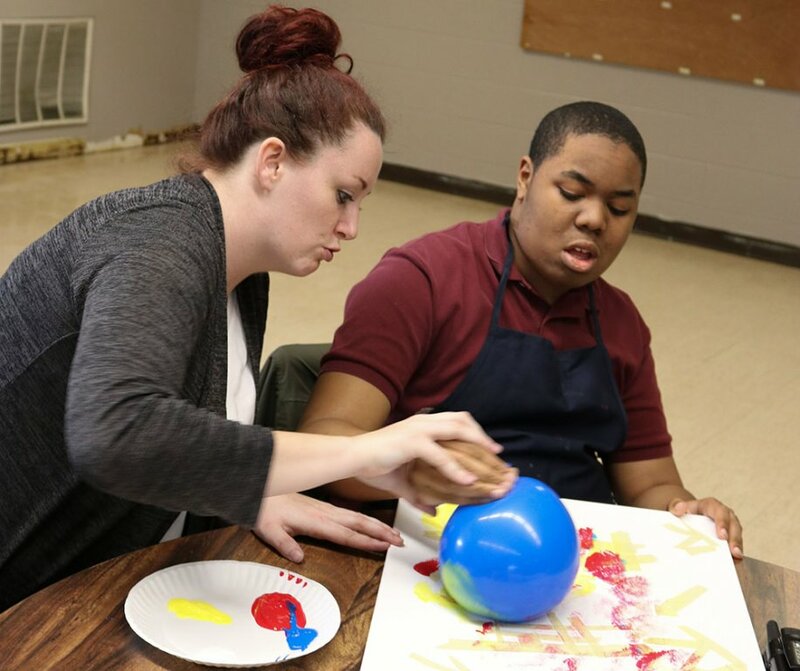 Intervention Specialist Tia Case supports Javon as he paints with a balloon. Drew of Visionaries + Voices with Shane. Zach shows off his colorful Resist Art painting. Erick and Educational Aide Alex Ely choose a watercolor. Direct Support Professional Karlie Guido and Aiden paint over white crayon drawn over a canvas in another Resist Art project. Xavier traces a hot air balloon onto paper to be cut and shaped into a 3-D masterpiece. Javon unveils his 3-Dimensional hot air balloon.